Yes, I’m really trying to catch up with all my tags today. This one is very different from Tim’s but I love it. Just check out the link to his tag to get all the instructions. After following his instructions on how to make the tag and only using one color instead of several, next comes the embellishments. I used his Drill Punch to make a tiny hole in the little bells and wreath from his Holiday Adornments. Then using some alcohol ink and a little plastic bag, I colored the jingle bells. They are strung with silver cording and looped through the Holiday Adornment. 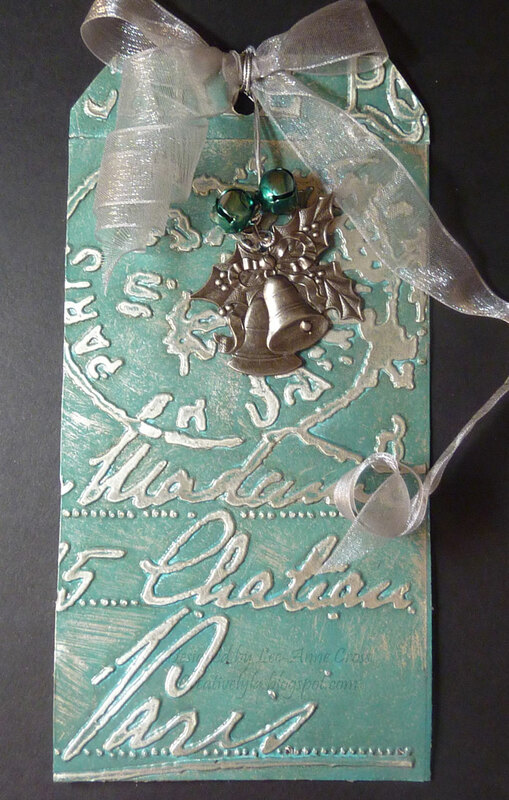 A bow was fastened to the top of the tag and then the silver cording with the bells and wreath were tied around it. Pretty simple but I like the look! C'est tres francais, n'est pas? This one might be my favorite…that color and the silver is like a Tiffany Box. Such wonderful texture and depth. Yep, it's gorgeous!!! Great Job, I really was disappointed with Tag 6, just not that great (too much), but your version is very pretty. Love the colors and the clean lines, great job. Your tag is beautiful. I like the frosty look of the single blue colour.